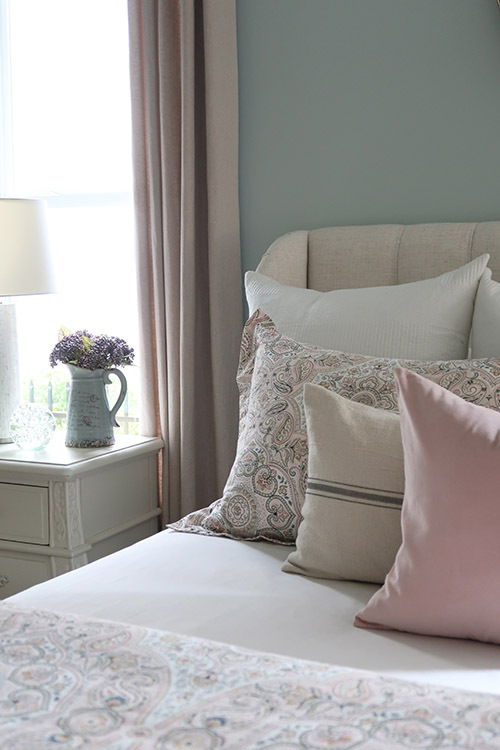 Have you noticed the blush and gray combination showing up in home decor this year? 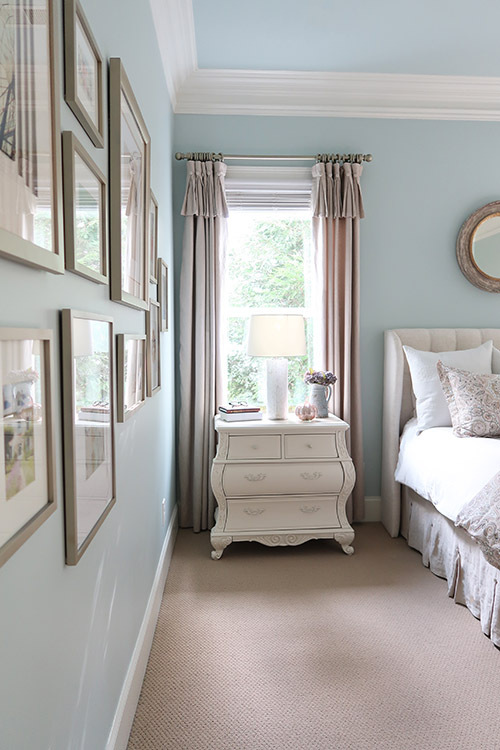 I have and decided it was the perfect mix of colors for my fall bedroom update! My first year making over my master bedroom for fall! Join me. Anyone who grew up in the 80’s knows the blush and gray combination well! I had many outfits in these colors and still love it today. 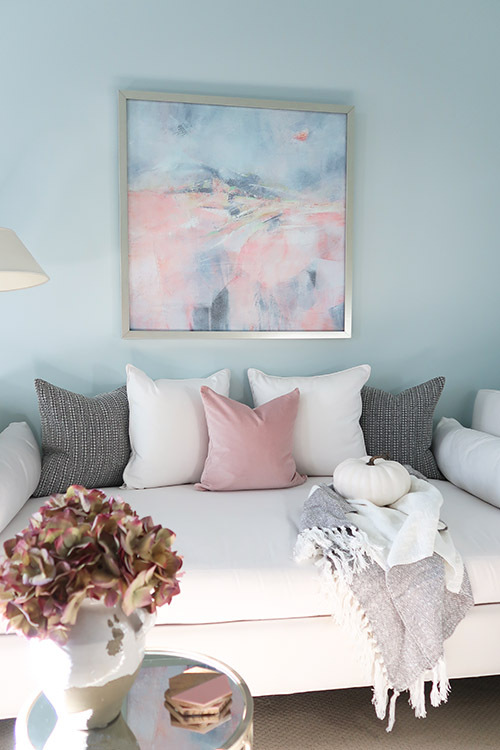 Blush pink has become a new neutral in home decor and I full embraced it in my master bedroom. 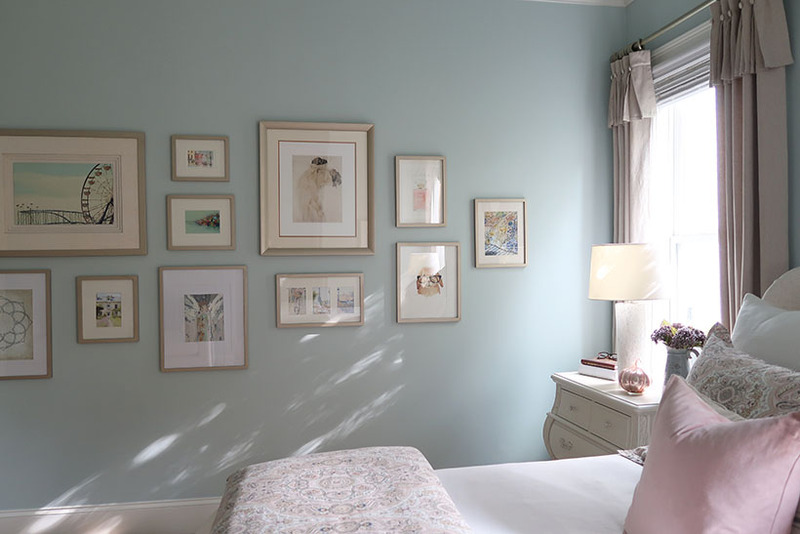 It’s beautiful but was feeling very spring and summer, with the other pastels I had in the room. 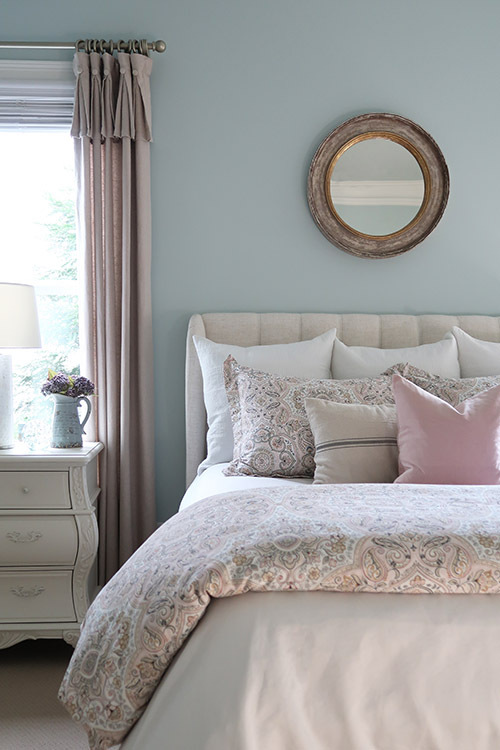 It was time for an update – a not expensive update to the master bedroom. After looking at lots of Pinterest boards and catalogs, I realized adding gray with the blush was going to be the perfect mix for fall. 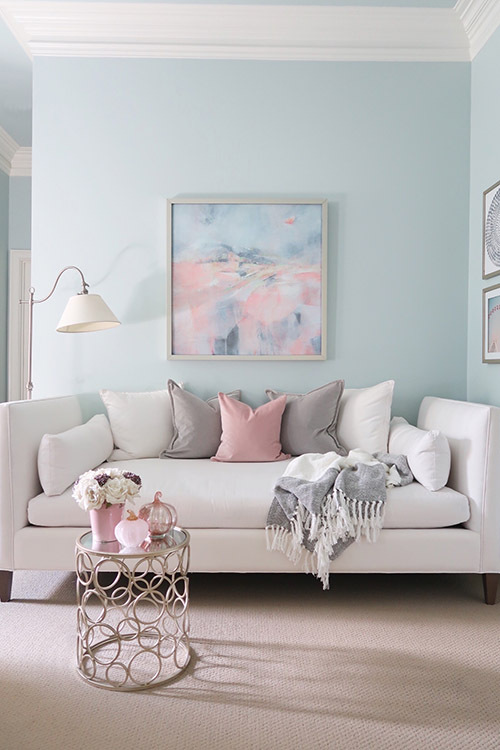 Blush and Gray is also a hot color trend combination showing up in Pottery Barn and even at Lowe’s Home Improvement stores. The 80’s are back! 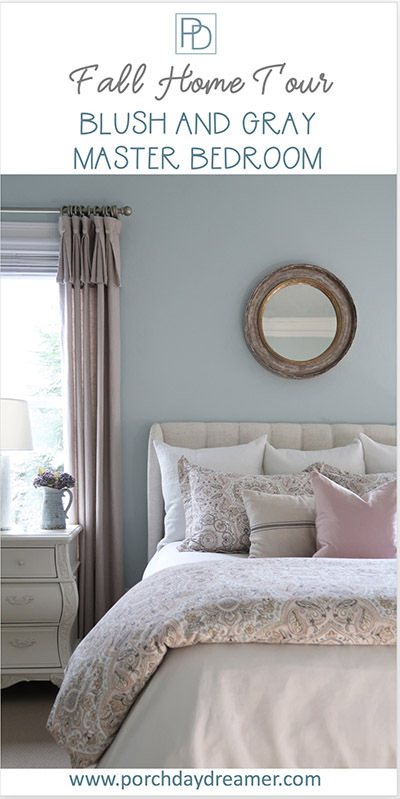 Loving to be a color trend setter 🙂 I went in search of blush and gray products to incorporate into my bedroom! Luckily, no matter what the season the sun streams in the windows from the east. Mick and I love this cozy corner of the bedroom. It seems in the fall my mood to decorate kicks into full gear! 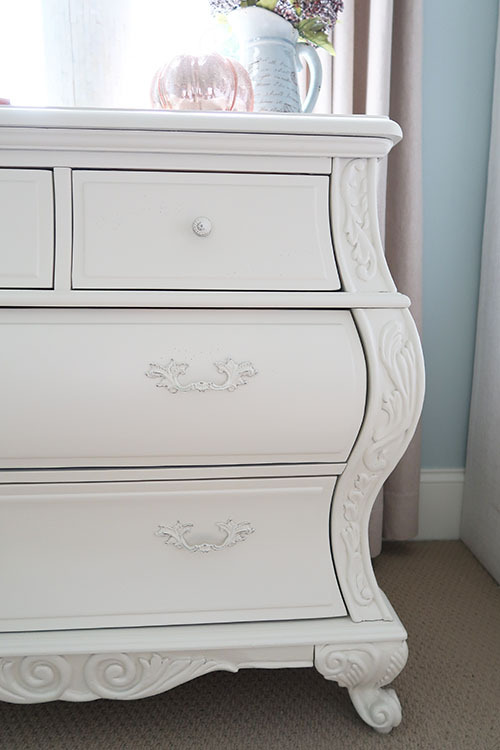 Last fall, to lighten up the room, I painted the nightstands and the large french armoire. 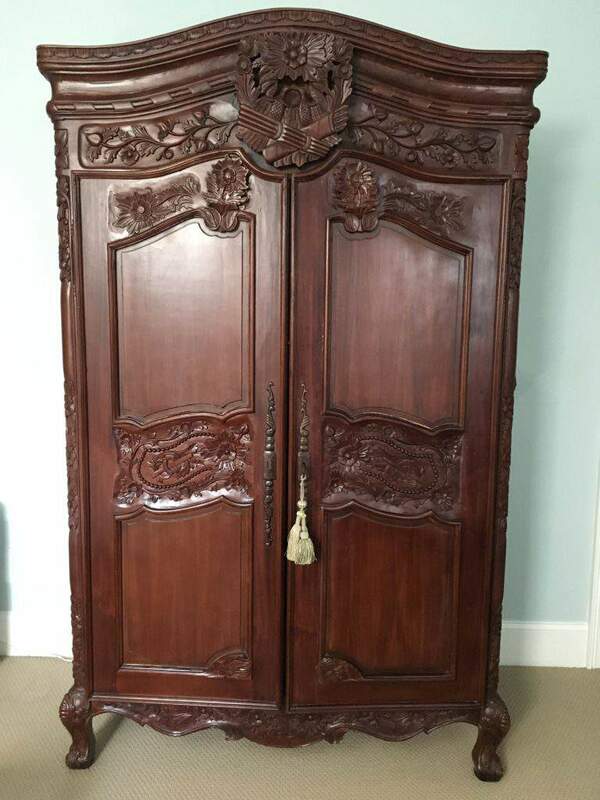 The crazy part was I used an airless sprayer in my bedroom to paint the armoire because it couldn’t be moved! I’m so happy with the color change taking the furniture pieces from a dark stain to a creamy off-white for a more neutral base to decorate around. Then I also replaced the headboard with a beautiful winged back upholstered version. I LOVE the new headboard. Last, but not least the corner got a major upgrade with a daybed, if you want to see the before click here. All of those changes last fall left me with a beautiful neutral base to start from for this fall’s makeover! Starting with a neutral base is always a good option. If you are new to decorating or making over a room, keep that in mind. 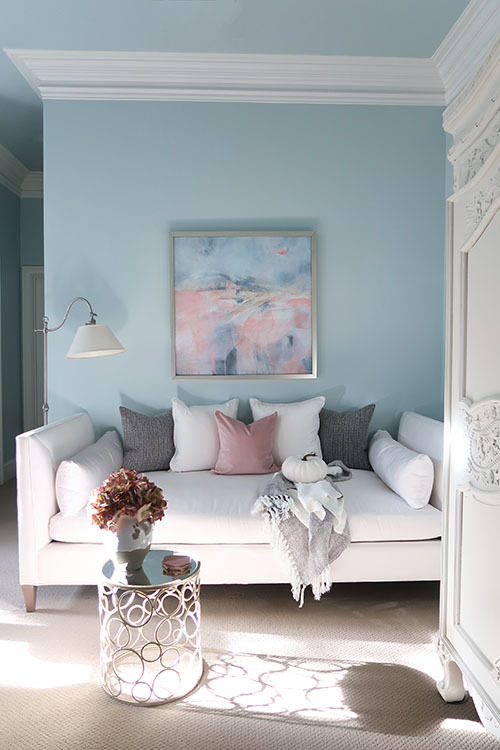 With the large pieces like the furniture, comforter/duvet, bedskirt, drapes, etc in creams and whites you can change the decor simply and easily anytime you want – in a year or five! Since I was keeping all of the pieces mentioned above, I also had to look at my artwork. The large square art over my daybed is only a year old, so I needed to keep it. 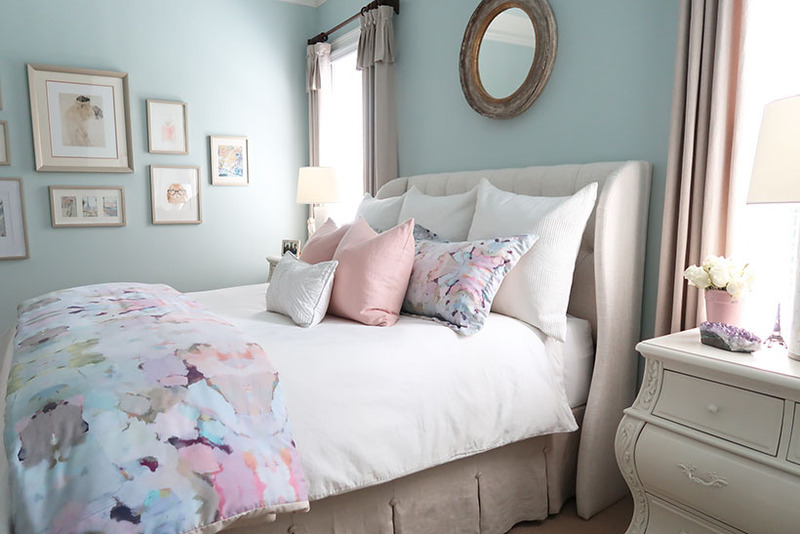 That meant pink/blush was going to be at the core of this bedroom update! The first thing I shopped for were blush velvet pillows. I knew I wanted to keep that color in play and just update the texture from linen to velvet for a more cozy less summery feel. World Market had beautiful blush velvet pillows for only $9.99! Very budget friendly. To bring in gray, this grain sack bed pillow was perfection because it tied in the linen bedskirt, drapes and texture in the headboard. Last, but not least, for a little more gray a soft washed gray velvet pillow cover for only $15 each on sale! 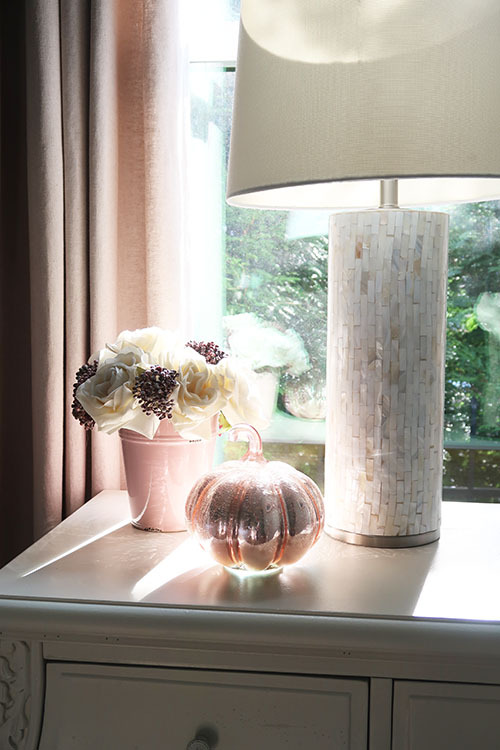 Then, when shopping locally I found this CUTE blush mercury glass pumpkin that had to come home with me. It was perfect for my bedside table. Here is one that is similar. 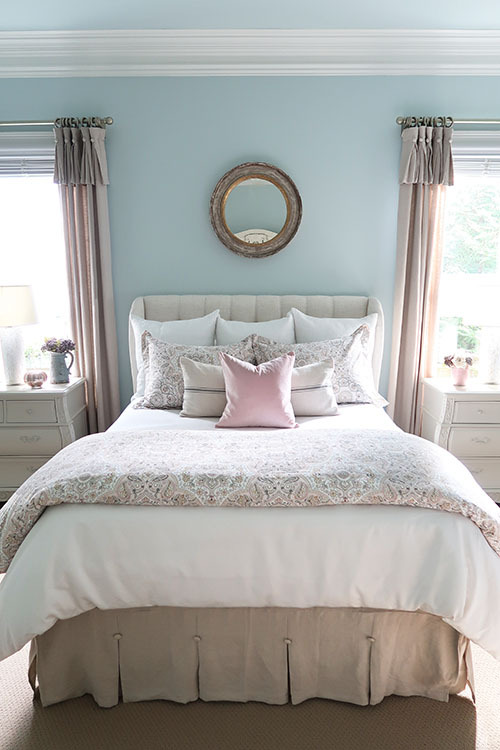 After hunting and googling for blush and gray bedding options, I landed on a beautiful set. No matter where I look I seem to end up back at Pottery Barn for bedding! They really do have the best quality, design and value. All of my PB items have lasted for years. 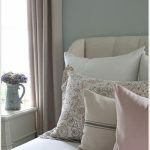 The Anya Sateen bedding had blush, gray, cream and hints of blue so it picked up all of the colors of the room perfectly! Guess what? With most things on sale, I spent under $300 for this full makeover that has big impact! See what that neutral base does to ease the budget? 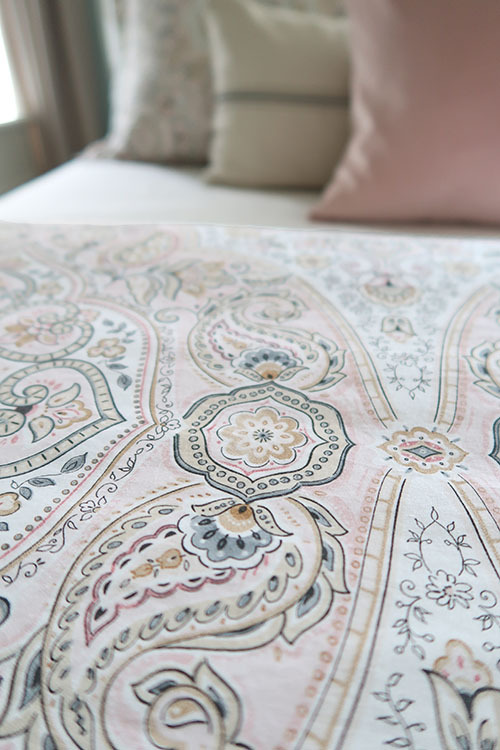 To start, here is a close up of the pattern in the bedding. Isn’t is just gorgeous? Another couple of small projects I added to this makeover were to spray paint the curtain rods (tutorial coming soon) and sand the painted hardware of the nightstands. Both were projects I had planned to do last year and finally got around to completing. I’m SURE you understand how those little things slip down on the priority list! I love how there is a little more dimension to the hardware! Now the curtain rods match the picture frames that I spray painted in the room. The how to spray paint picture frame tutorial is HERE. The rods look SO much softer and blend into the decor now. Guess what y’all I am keeping my CEILING FAN! I know a chandelier would be so much prettier, but for now I can’t part with the whir of air above my head. 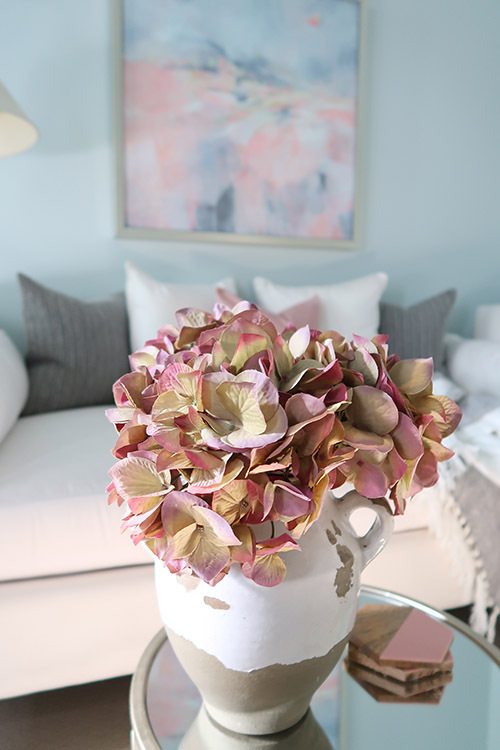 I’m loving the layers of color and texture and ended up buying another grain sack pillow for the family room! The long bed pillow inserts were a little hard to find, but I found an affordable non-feather 14 x 36 option here. That cute little pink pumpkin just puts a smile on my face! What is SO nice about fall decor is you can leave it out for MONTHS. 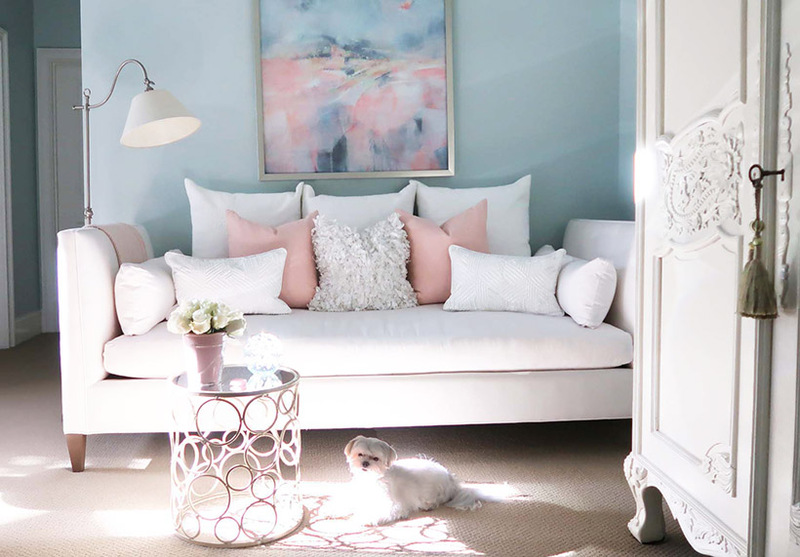 With just a few new pillows and accessories, the daybed corner has a whole new look! The throw was on clearance at Pottery Barn, so I’m not able to link the source – sorry. The artwork I modified from the original with a white wash of paint, but if you’d like to see the original it can be found here. It’s funny how a white pumpkin can just add a little pop of fun, when styling a room 🙂 Then the next week I decided I didn’t like those dark pillows and made it over again! Plus used my favorite two glass pumpkins in pink on the little table. If you want to know where to buy glass pumpkins, I have a WHOLE blog post about it!. 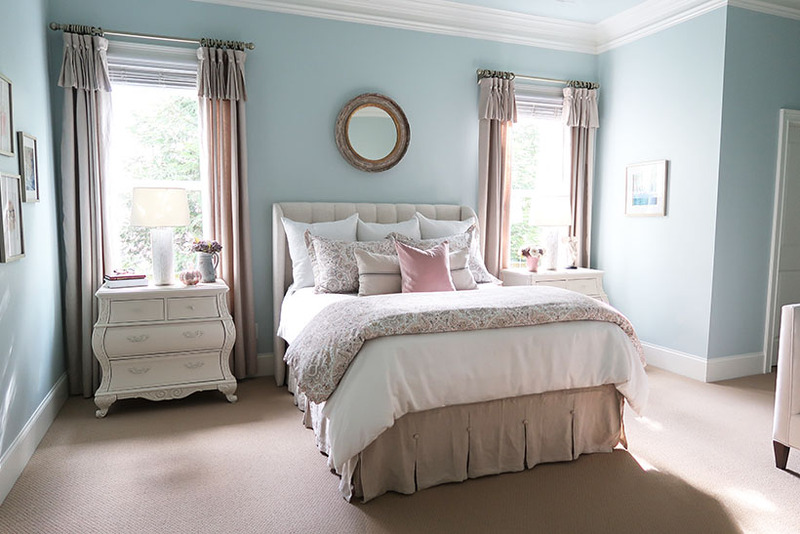 Hopefully, I’ve given you some budget friendly ideas to either makeover a bedroom or how think through a makeover. Isn’t is great how just a few updates can make the room look completely different? 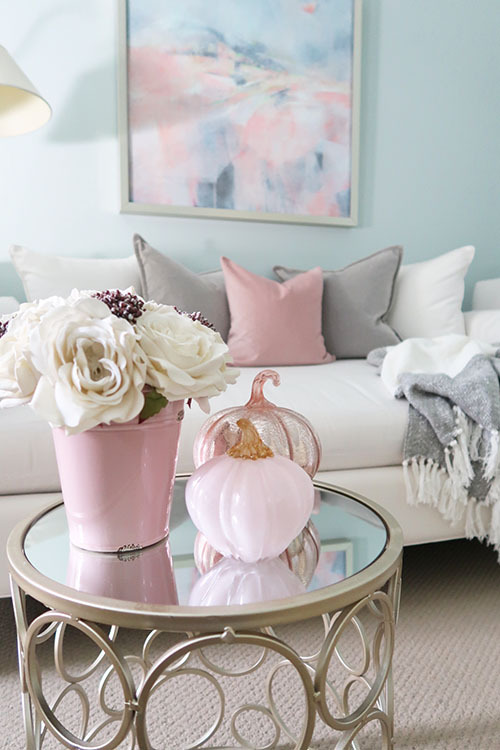 If you like this room update for fall and want to see more of my fall decor, read the Touches of Fall Home Tour where I’ve linked 5 of my other blogger friend’s homes. 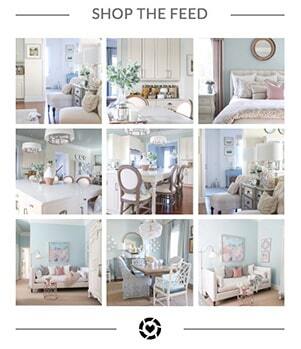 Or if you want to know my paint colors check out this post! 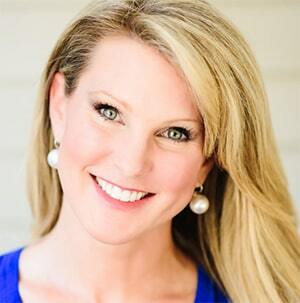 Please consider signing up for my once a week email newsletter so you never miss a post! That is a beautiful color combination. I was wondering how difficult it was to use an airless sprayer. I’ve heard good things and not so good, and was asking what your experience is with one. From the result of your finished project it was great. Very inspiring. Thank you! I’d follow the link in the post that shows exactly what I did. Or in the search bar of my website, if you type “airless sprayer” everything I’ve written and videos will come up with lots of detailed information.